As time goes on, raccoon sightings in urban and residential areas are becoming increasingly common, thanks in large part to urban sprawl and a diminished natural habitat for these creatures. 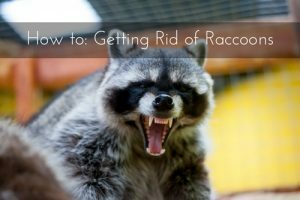 Seeing raccoons on your property is never a good sign, and you should take the following steps to discourage their activity before they attempt to invade your home. Eliminate their food and water source – Things like pet food bowls or uncovered garbage cans are an open invitation for raccoon trouble. Additionally, be sure to put away your bird feeders each night, especially if they hang near your home. Food is the number one reason raccoons invade properties, and cutting that off is a huge step in the right direction. Create a hostile environment – Installing a fence can be effective, but determined raccoons will eventually make their way over. For especially persistent raccoon problems, an electrified fence that operates during nighttime hours can be an extremely effective deterrent. Additionally, you should clear your yard of any debris they could hide behind, or branches they may lead them to your roof. Scare them off – Since raccoons operate mostly at night, there are plenty of tools available to help ward them off using light and sound. Motion-activated sensors, flood lights, ultrasonic noisemakers, and sprinklers all have been proven to scare off night critters. The downside, however, is that you will periodically have to change your tactics as raccoons are very adaptable creatures. If raccoons have encroached on your property and nothing is getting them to leave, the experts at Critter Control® of Miami can help. Our wealth of experience and attention to detail mean you can trust us to get the raccoons away and to keep them away for a long time to come. To learn more about our raccoon removal services, call us today at 305-258-3587.